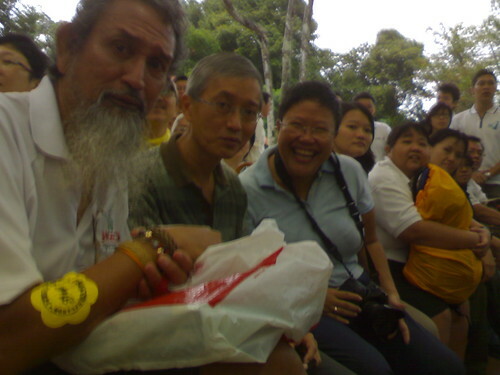 07 Jul 2007 - Once again Ria Tan popped the bubbly and religiously poured it out for a bunch of volunteers at at Chek Jawa. She carried out this ritual after the news of deferment of reclamation (Dec 2001), upon greeting the millenium (31 Dec 2001) and at new year's the following year. Once again champagne and camera were brandished, this time at House No. 1, Chek Jawa. In preparation, she had reminisced on the wildfilms blog the previous day, just as I beegan thinking about doing so - simply too fast, that woman! The reason for our celebration? "Chek Jawa Wetlands" was officially declared open by Mr Mah Bow Tan earlier this morning, and the public can now visit the Chek Jawa boardwalk (Mangrove and Coastal Loops), the Jejawi tower, House No. 1 and a viewing jetty without a booking between 8.30am - 6.00pm any day! No more restrictions to visiting Chek Jawa, hooray! Please note that access to the shore, however, is strictly limited to bookings - see the NParks webpage: Pulau Ubin> "Guided Tours at Chek Jawa." Pouring the bubbly while the rest anticipate a celebratory drink. 100 plus for the teetotalers! The mildly rowdy crowd of assorted volunteers! In 2001, feedback submissions to the Singapore government about Chek Jawa included somewhat wistful proposals about the protection of the reclamation-doomed Chek Jawa for education, research and recreation. The proposals included the suggeston to set up a marine reserve there, the establishment of a boardwalk system and the conversion of House No. 1 into a visitor centre. Conceptual map from a feedback document to the government in October 2001. Some of these things have since come to pass. Since the announcement of the deferment of reclamation at Chek Jawa in December 2001, some 20,000 people have visited the shorelines of Chek Jawa and research is also picking up there. However the diversity of marine life is best only seen at low spring tides which are fairly rare. In addition, the soft habitats teeming with marine life would suffer under the onslaught of trampling feet. So the system initiated in Dec 2001 to cope with visitor traffic and impact has been exercised since, by NParks, with the help of a few cohorts of volunteers. However, this has meant that many Singaporeans were unable to visit Chek Jawa. The $7 million, six year wait is worth it! In 2002, NParks began a S$7 million project which first saw them work to acquire the funds. Once this had been achieved, NParks went on to call for a biodiversity impact assessment, design proposals for the site, a minimised construction and impact process, the heritage conservation of House No. 1 and a whole variety of large and small issues. Since 2002, they hosted a Chek Jawa Working Group of invited representatives of the Nature Society (Singapore), Singapore Environment Council and the Raffles Museum of Biodiversity Research, National University of Singapore. Feeback at each stage was provided to NParks and it extended beyond the few representatives. For example, while I represented the Raffles Musem at the working group, I provided updates and recruited feedback from Ria Tan, Chua Ee Kiam, Subaraj Rajathurai, Joseph Lai and Teh Tiong Sa through a maiing list. This morning, the working group ended its tenure when Mr Mah Bow Tan announced the opening of the Chek Jawa Wetlands to a slightly wet but delighted crowd! Some familiar favourites - Grant, Ee Kiam, Ria, Yueat Tin, Chay Hoon and Genevieve. A wet but happy launch! I walked the boardwalk for the first time during a low tide and it surprised me. I was able to enjoy an interesting perspective of the shoreline at low tide that I had not appreciated before. You do miss out on the texture of the ground and fauna, and a binoculars is now required to spot the tiny critters. But marine biologist Prof Leo Tan and myself were both pleasantly surprised by the views we were able to enjoy. You can better see the connections between the ecosystems and the geography of the area. We were noticing details that we had not observed before. 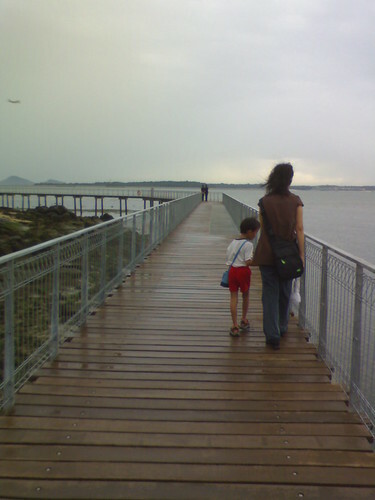 The boardwalk is wide and overlooks this open area, allowing many different views. We were even spotting the uneaten oysters! Fauna like mudskippers and fiddler crabs were no longer retreating from pounding footsteps so you can witness their displays. I am thankful for the non-intrusive view the boardwalk now provides. We are held up closer to the tree line of the cliff forest and I was able to differentiate the diversity more effectively. Every perspective offers a difference and the boardwalk captures a unique one. in the mangrove forest to the delight of photographers. The mangrove loop is free of railings so you are close to the forest, mud lobster mounds and tree-climbing crabs. And finally, you get to see a Nypa forest! The Jejawi tower is a real treat and Subaraj was raving over the space at the top - it allows 40 people at any one time - but do look out for lightning! Chek Jawa has suffered significantly since 2001 but the promise she held then has not vanished. I returned to House No. 1 feeling quite pleased - I feel the public has a place they could enjoy, even at high tide, and there are plenty of opportunities for education that did not exist before, and for more people than ever before. It's certainly the start of something new! Welcome back to Chek Jawa, everyone! More photos on Flickr - tagged with "cj070707". "Chek Jawa Journey: a new chapter," by Ria Tan. wildfilms, 07 Jul 2007. "Chek Jawa is now open! ...any-tide," by Loh Kok Sheng. God's wonderful creation, 07 Jul 2007. "New Amenities At Chek Jawa Wetlands Now Open - From 8 July 2007, Visitors Can Tour Chek Jawa Seven Days A Week" - Media release.